Moving the Needle: Tim Hudson picks himself up with a homer, +.336 WPA. 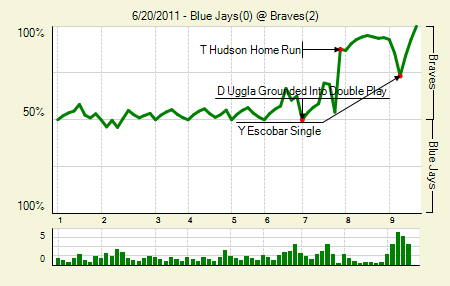 The Braves managed just six hits in this game, including two doubles, but they just couldn’t cash in their runners. They were 0 for 7 with runners in scoring position when Hudson came to bat in the seventh, with a runner on third and two outs. That’s when he took complete control of the game. On the first pitch he lined a shot out to left, giving his team a 2-0 lead. Tim Hudson: 8 IP, 2 H, 0 R, 1 BB, 8 K, 16 GB. The Braves came up a little short with just six hits, but the Blue Jays managed only two all game. The only reason Hudson ran into any trouble at all was because of an error to lead off the second. In the third he retired the side on four pitches, inducing three ground balls. After the second, the Blue Jays didn’t put a single ball in the air. Even without the complete game it ranks among Hudson’s best starts of the year, and that doesn’t even factor in his offensive contribution. Ricky Romero: 7 IP, 6 H, 2 R, 2 BB, 4 K. It wasn’t his best start, but Romero did nearly all he could to hold down the Braves. Unfortunately for him, it was Hudson’s night. Moving the Needle: Orlando Hudson ties the game with a homer, +.271 WPA. The Padres’ moment of equality wouldn’t last long. They fell behind the Sox in the bottom of the first, and by the sixth were down 3-0. 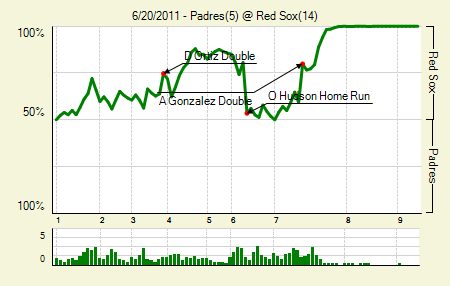 The first two men reached that inning, and Hudson cashed them in when he crushed one over the monster in left. They threatened for more, too, but couldn’t scratch across that go-ahead run. The score remained tied for the next inning, but in the seventh the Sox put up a 10 spot, including two runs on hit by pitches and one on a walk. Adrian Gonzalez: 3 for 5, 1 2B. He drove in three for the game. His seventh-inning double put the Sox back on top and started the crazy rally. David Ortiz: 2 for 4, 1 2B, 1 BB. The walk was intentional. It was followed by an unintentional walk, and then two straight hit by pitches with the bases loaded. Chase Headley: 4 for 5, 1 2B. A valiant performance in a losing effort. 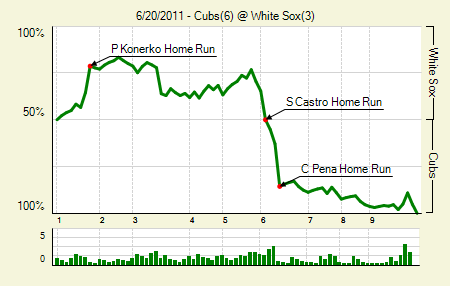 Moving the Needle: Carlos Pena’s three-run shot breaks the tie, +.228 WPA. After going down 3-0 in the first, the Cubs battled back to tie the game in the sixth. Even after tying it they kept the rally going, with two men reaching base before Pena. He worked the count 3-2, and then blasted an outside pitch over the wall in right-center to give the Cubs a 6-3 lead, basically ending the excitement for the night, as both teams went relatively quietly after that. Carlos Zambrano: 8 IP, 7 H, 3 R, 1 BB, 5 K. Three hits and all three runs came in the first inning. After that he settled down nicely, running into trouble only in the fifth. Starlin Castro: 2 for 4, 1 HR. He drove in the Cubs first three runs, which tied the game. Moving the Needle: Robinson Cano doubles home a run in the first, +.121 WPA. 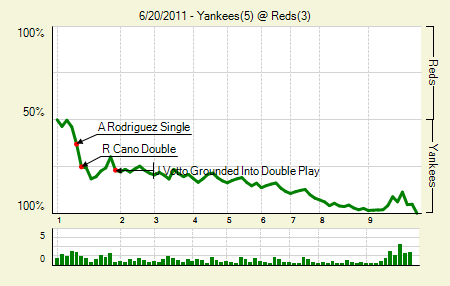 The Reds were already down 1-0 by the time Cano came to the plate in the top of the first, but they appeared to handle him well. Travis Wood kept his pitches out of the zone, which induced swings from the hacking Cano. But then Wood left the 1-2 pitch in a hittable spot, and Cano smacked it to left for an easy double. The hit brought home the second run and set up a second and third and one out situation, which led to another pair of runs later in the inning, giving the Yankees a cushion that they’d hold most of the game. Ivan Nova: 8 IP, 4 H, 1 R, 0 BB, 7 K. The youngster comes up with the best start of his career, matching his career high in strikeouts and completing eight innings for the first time. The strikeouts are the big surprise. Nova has one of the lowest swinging strike rates in the league, yet he induced eight of them on 105 pitches last night. It’s not great, but it’s about double his season-long rate. Inducing 16 ground balls didn’t hurt, either. Moving the Needle: Jason Giambi’s bomb caps a fifth-inning comeback, +.316 WPA. 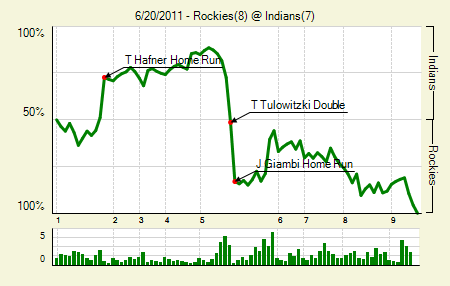 The Rockies struck first by scratching across a run in the first, but the Indians answered that and then some. Two homers gave them four runs and the lead, but they’d give it all back in the sixth. The Rockies loaded the bases after the first two batters recorded outs, and then they struck. A walk and a double tied the game at four, and Giambi, back in a familiar role at DH, punished a Carmona pitch way over the wall in right-center to give the Rockies a 7-4 lead. The Indians answered with a pair in the bottom of the fifth, and they later answered a Rockies run with another of their own, but they never tied it back up. Carlos Santana: 3 for 4, 1 HR. His one out was a strikeout, so he picks up a bit on his very low BABIP. Troy Tulowitzki: 2 for 5, 1 2B. Giambi put the Rockies ahead, but Tulowitzki did a lot of legwork in tying the game, as he drove in three of the team’s first four runs. Moving the Needle: Erick Aybar sets up the go-ahead run in the eighth, +.141 WPA. One criticism of WPA I’ve heard is that it doesn’t give enough credit to the guys who set the table. That is, a player who smacks a three-run homer will get a big WPA boost, but it wouldn’t be that large if not for the two guys who got on base in front of him. Sometimes, especially in low-scoring games, the set-up guys do get recognition. 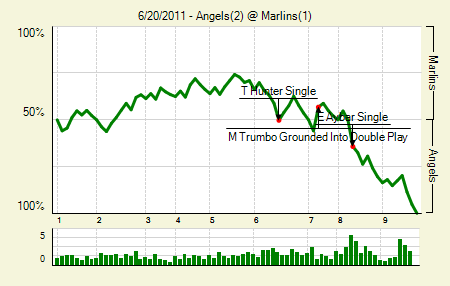 That’s what happened in last nights’ Angels-Marlins tilt. With one out in the eighth Aybar singled, moving the runner to third base, and allowing him to score on a ground out which put the Angels on top. I’m fairly certain that if the go-ahead play were a single rather than an out, it would have constituted a bigger WPA swing. But at least in this instance, the set-up man gets the credit. Anibal Sanchez: 7 IP, 8 H, 1 R, 0 BB, 8 K. If the Marlins wanted to keep getting younger in order to rebuild, they could fetch quite a bounty for Sanchez at the trade deadline. But they won’t, because it would leave them with basically no pitching staff. Jered Weaver: 7 IP, 5 H, 1 R, 1 BB, 6 K. Last year was a career year, thanks to an aberrant strikeout rate. Now his strikeouts are down to around his career levels, but he’s having an even better year. The big difference: aberrant HR/FB rate. Maicer Izturis: 3 for 4, 1 2B. He scored only one of this three times on base, but it was the big one. Moving the Needle: Michael Young keeps the first-inning carousel moving, +.114 WPA. The Rangers wasted no time in dispatching their intrastate rivals. In the first they put two men on with one out, and rode a single, double, and sac fly to a 3-0 lead. Young’s was the big hit, both in terms of distance and WPA swing. The double brought home a run and set up a sac fly situation. Michael Bourn almost got to it, but it was just out of his reach. It’s a shame, too, because that could have changed the tone of the entire game. 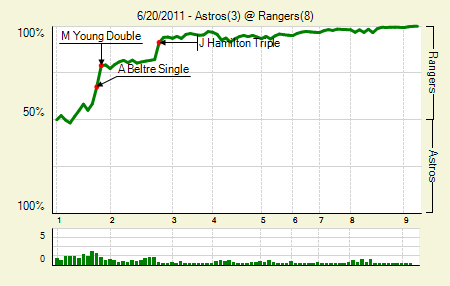 Then again, it might not have stopped the Rangers from piling on another three in the second. Josh Hamilton: 2 for 4, 1 3B. After this triple he did not try to take home on a sac fly in foul territory. Nosiree. Derek Holland: 7.1 IP, 6 H, 3 R, 3 BB, 4 K. Three legitimate runs, or three runs earned while pitching to the scoreboard? Whatever the answer, this is the seventh time in 15 starts that Holland has gone at least seven, and it’s the fifth time he’s gone into the eighth, which slightly mitigates his otherwise rough season. Moving the Needle: Juan Uribe’s homer gives the Dodgers an early lead, +.109 WPA. The Dodgers didn’t need many runs in this game, as they got one of those special, dominant Kershaw performances. 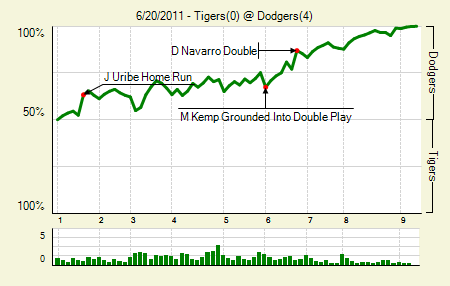 It came as a great relief, then, when Uribe blasted one out to left-center in the first inning. That’s all they’d need, but they did tack on a few more later in the game, just for good measure. Clayton Kershaw: 9 IP, 2 H, 0 R, 1 BB, 11 K. As is almost always the case after a Kershaw start, my favorite part of the morning was watching the highlight reel of all his Ks. As if his brilliant performance weren’t enough, he also drove in two insurance runs with a single in the eighth. He retired the final 13 in a row, and 17 of the last 18 he faced. James Loney: 3 for 4, 1 2B. Hey hey, his wOBA is almost .300 now. Moving the Needle: Justin Ruggiano kicks off the seventh-inning rally with an RBI double, +.115 WPA. Former FanGraphs scribe R.J. Anderson described this one perfectly when I asked him what was going on in the game: it was a typical Jeff Niemann, Chris Harveson match-up. Which is to say lots of base runners. Yet through six they managed to score just one run combined. 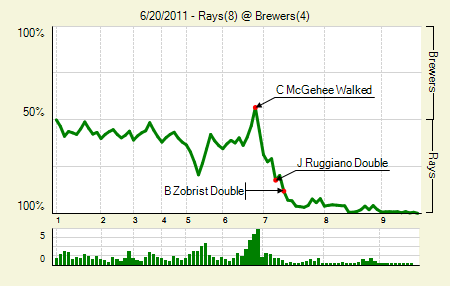 That changed in the seventh, when the Rays put together a four-run inning to take the game. Ruggiano started it with a double to make the game 2-0. A double then brought him around, and then a single, wild pitch, and another single made it 5-0. Evan Longoria: 2 for 5, 1 HR. His 3-run shot in the eighth seemed superfluous at the time, but it ended up coming in handy, as the Brewers added a few runs later in the game. Ben Zobrist: 2 for 4, 1 2B, 1 BB. The double came as part of that seventh-inning rally. Moving the Needle: Nick Markakis sets the table in the first, +.100 WPA. Again we have an instance where the table setter gets the bulk of the credit. Markakis, the second batter of the game, doubled after a lead-off single, putting runners on second and third with none out. 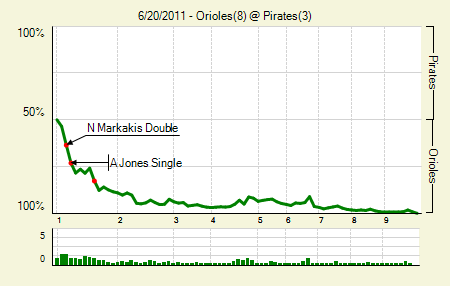 Somehow Adam Jones’s follow-up two-run single didn’t move the needle further than Markakis’s hit, which is just fine. Let the table setters have their day. The Orioles ended up batting around in the first and putting a five-spot on the board, which was more than enough to slay the Pirates. Andrew McCutchen: 3 for 4, 1 2B. Go to the box score and scroll to the Pirates Standard. Then you’ll see why McCutchen makes the notables: his line leaps off the page at you. Orioles offense: 14 for 38, 2 2B. It’s not often you see an eight spot with just two extra base hits in the game. Yet the only non-single hit by the Orioles after Markakis’s was a Matt Wieters RBI double in the second. We hoped you liked reading The Morning After: Game Recaps for June 20th by Joe Pawlikowski! Minor detail: the runner was on first for Hudson’s HR, not at third.